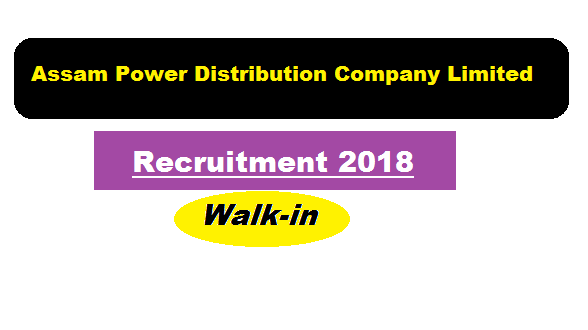 Assam Power Distribution Company Limited (APDCL) Recruitment 2018 August | Technical Assistant (Electrical) [25 Posts] :- Good news for people who have done B.Tech/B.E in Electrical engineering. Assam Power Distribution Company Limited (APDCL) has published a recruitment notification in the month of August 2018 for filling up Technical Assistant positions. According to the latest APDCL recruitment 2018 , A Walk-in-interview is scheduled for selection of candidates for the post of Technical Assistant (Electrical) for ‘SAUBHAGYA’ project work under Rural Electrification(RE) wing of Assam Power Distribution Company Limited (APDCL) purely on contractual basis. We have explained in details about this APDCL Jobs in below section. In this section, we will discuss in detail about Recruitment of Technical Assistant posts under APDCL Recruitment 2018 with all the details and requirement. Job Description: Assisting Field Officials APDCLin supervising and monitoring of rural electrification works. Educational Qualification : Candidates must have done B.E/ B.Tech in Electrical Engineering with minimum 50% marks from AICTE approved recognized Board/University/lnstitute. The candidates should have proficiency in managing database and preparing reports with Microsoft Office Programme. Also prior experience in village electrification works will be preferable. Age Limit: The candidate should not be more than thirty(30) years of age as on 01/03/2018. The interested candidates may appear before the Selection Committee with updated Bio-data alongwith original certificates, mark sheets, experience certificates with self attested photo copies and a recent passport size photograph. No TA/DA would be provided for attending the interview. Interview Venue: Conference Hall, Ground Floor, APDCL, Bijulee Bhawan PlatanBazar, Guwahati-01.